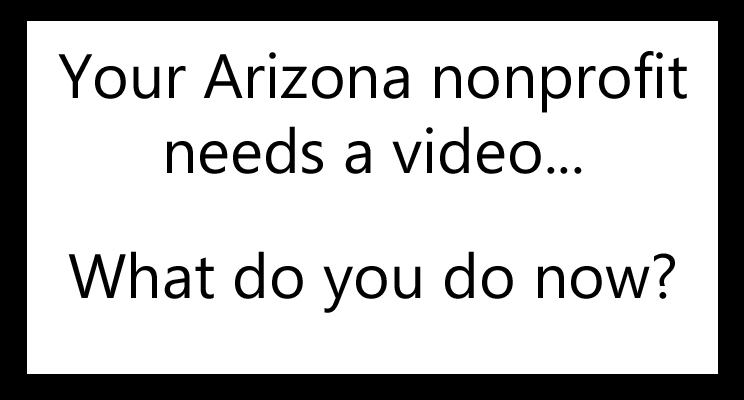 Your Arizona nonprofit needs a video… what do you do now? Unless you’ve worked with a video production company in the past, this can be a challenge. You can do a search online, click on a few paid ads at the top of the SERPS’s, maybe even click on a few of the companies that rank organically. You could check out Facebook or LinkedIn, more ads and more organic results. You could dig deeper into the web and wade through more search results but is that the best way to go? Wouldn’t it make more sense to talk with your peers and see who they’ve worked in the past to create their videos? If you’re based here in Phoenix, chances are you’ll hear that name Baerclaw Productions when you start asking around. Why? Because we’ve worked with nonprofit organizations here in the Valley and around the state of Arizona for more than 20 years. We could tell you about all of the award videos, ASK videos and awareness videos that we’ve done since we opened our doors in 1997, but that’s going to take up more of your valuable time. Let us make it easy for you – click here to see our nonprofit video playlist. You’ll see the latest nonprofit videos that Baerclaw Productions has produced and then you can reach out to the organization’s that we’ve worked with and talk with them. They’ll tell you what you need to know about Baerclaw Productions. We understand the nonprofit world. We go above and beyond to make sure that our nonprofit partners get what they need – on time and on budget. After you talk with your peers, give us a call at 602-789-8396 and let’s talk. There’s no obligation, you can tell us what you need, we’ll put together a plan and then we’ll give you a free quote so that we can get started on your nonprofit video production. Baerclaw Productions… Let us be Your Resource For ALL Things Video! Shamrock Farms and Rockin’ Refuel – Baerclaw Productions latest partner! Since 1922, Shamrock Farms has been an Arizona institution and they continue to give back to the communities they call home and they turned to Baerclaw Productions to help share an exciting new program. 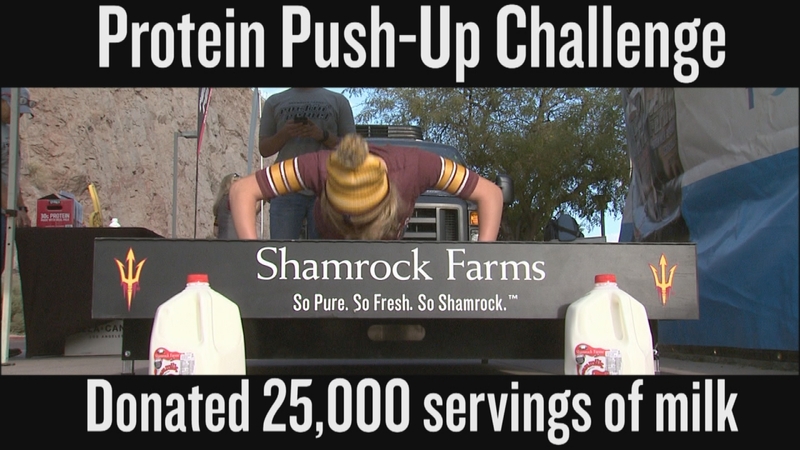 Shamrock Farms has launched the Protein Push Up Challenge where they are going to donate one serving of milk to a local food bank for every push-up that people do at various events including a recent one outside of Sun Devil Stadium and Baerclaw Productions was on hand for all of the fun. In all, they will donate 25,000 servings of fresh milk to local food banks. 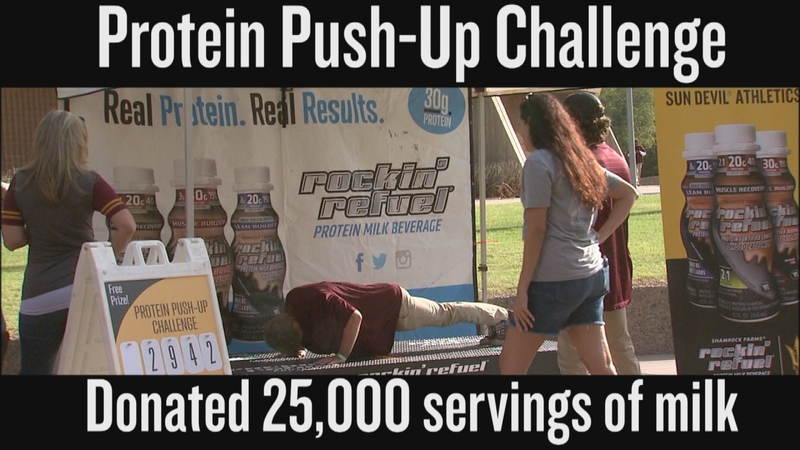 With more than 10,000 cows busy at the dairy, our crew had fun with the fans documenting the push-ups in progress! The Baerclaw Productions team handled all of the video production and post production services to create a short promotional video that was debuted on the big screen during the ASU – U of A football game. If you’d like to see the video, click here. If you’d like to learn more about Baerclaw Productions, visit our website at https://www.baerclawproductions.com and you can see more of our work by visiting our YouTube channel by clicking here. Since 1997, Baerclaw Productions, a full-service video production company in Phoenix, has been producing award winning video productions in Phoenix and around the state of Arizona. We have worked with companies and organizations of all sizes from small start-ups, nonprofits, for profits all the way up to Fortune 100 companies. Over the years, we have done Arizona productions that include corporate videos, training videos, web videos, nonprofit videos, commercials, public service announcements and a wide array of television video production including half hour television shows, infomercials and documentaries. As a leading Phoenix production company, there isn’t a video production Phoenix project that we haven’t seen and completed. If you’re ready to produce a Phoenix video, let us be Your Resource For ALL Things Video! Call us today at 602-469-0088 for a free consultation or visit our website at www.baerclawproductions.com. Giving back to the community? Share it with the world! If your company has made a commitment to the community and your team members are giving of their time to make a difference, take pictures of them in action! Giving back to your community is a great thing and you should share that on your website, a blog post or in a quick video that you can show to your existing and potential clients. Here’s something else to think about, T-shirts with your company name on them is a great way during the event and after to let everyone know that you and your team are on the front lines of making a difference in your community. One of the first projects that we did at Baerclaw Productions not long after we opened our doors in 1997 was for a company that gave their employees up to 40 hours a year of paid time off to volunteer for the charity of their choice. There are a lot of companies out there that do this and when your team members go out to make a difference, make sure they take pictures so that you can share the message with new and prospective customers. If you need help putting them together with either a voice over or music bed, give us a call at 602-789-8396 or visit our website at baerclawproductions.com and let Baerclaw Productions be Your Resource For ALL Things Video! We can quickly put it together for so that you can share it with the world! Championship golf is returning to Phoenix Country Club and everyone is talking about it! Phoenix Country Club, the original home of the Phoenix Open, will once again be hosting the PGA Tour and championship golf and you will be able to walk the same golf course that Jack Nicklaus, Arnold Palmer, Sam Sneed, Ben Hogan and all of the greats of the game have walked in the past by watching the Charles Schwab Cup Championship at Phoenix Country Club. Baerclaw Productions, a premier Phoenix video production company, put together a video to share what players and dignitaries are saying about Phoenix Country Club and the return of championship golf to downtown Phoenix. Listen to Governor Doug Ducey and Mayor Greg Stanton are saying and get a peek at what’s to come by clicking here. Since 1997, the Baerclaw Productions team has produced corporate videos, web videos, training videos, sales videos, training videos, testimonial videos, award videos, new product launch videos, television programming, infomercials, documentaries, green screen videos, nonprofit videos, commercials and PSA’s. If you have a need for video production, let us be Your Resource For ALL Things Video! Give us a call at 602-789-8396 for a free consultation or visit our website at www.baerclawproductions.com. If you’d like to learn more about Phoenix Country Club, you can visit phoenixcountryclub.com and if you’d like more information on the Charles Schwab Cup or want to purchase tickets, go here. Don’t be left in the dark – use these simple tricks to shine a light and spotlight on your company! Light it right to make it right! In the production business, the basic lighting set up that we use when interviewing someone inside is called three-point lighting. We’ll set up a light bank on each side of the person that we are going to interview and then hang one light over the top of them called a back light. 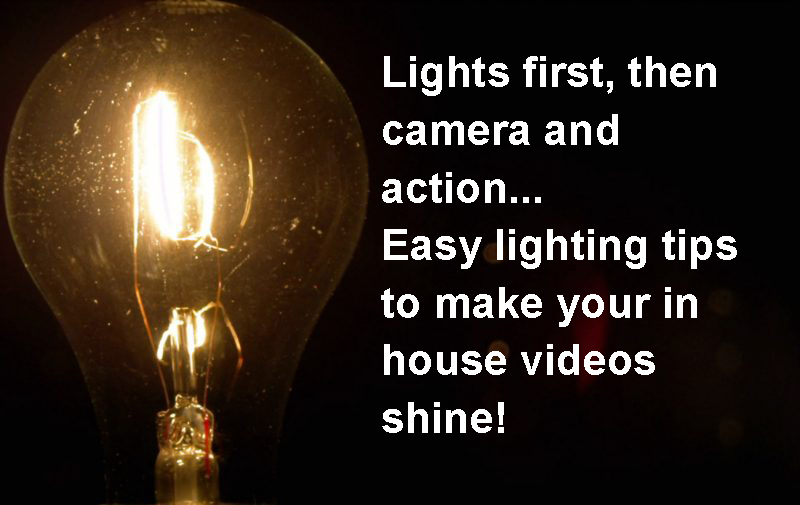 Chances are you don’t have the same lighting equipment that we do here at Baerclaw Productions, but you can still get close enough to make your videos look good by using this simple trick. Put two lamps about three to four feet from the person that you want to interview about half way between you and them. Take the lamp shades off and put a 60-watt bulb in one and a 40-watt bulb in the other. Then use one of the overhead lights in your office and put a chair just in front of that and have the person that you want to interview sit down in the chair. What you will end up with is one side of their face will be slightly brighter than the other side and there will be a little light on the top of their head and light on their shoulders. Hit record and you’re all set to go! There are also some other things that you should think about before doing an interview including windows and the blinds in the office. If you’d like to know our suggestions about those or have questions and need help getting started, call us at Baerclaw Productions and let us share our knowledge with you and prove that we are YOUR Resource For ALL Things Video! Zip code or genetic code – which is a better predictor of your overall health and well being? The answer is your zip code and changing that is goal of the 4th Annual Arizona Health Equity Conference at the Glendale Civic Center. The focus is on building bridges and connecting communities in research, practice and policy. To make progress when it comes to health equity for everyone in Arizona, it’s critical to get input from stakeholders around the state and that’s why the Baerclaw Productions team was brought in to create a series of promotional videos in English and Spanish to be used on the conference website and various social media outlets. The purpose of the videos is to help spread the word and drive registrations for the conference. Baerclaw Productions, a full-service Phoenix video production company, worked with representatives from two of the organizations involved and guided them through the script for the video. We then brought it back to our post production facilities and went to work. We needed to incorporate still photographs from previous conferences, acquire stock video to help tell the story and create all of the graphics and open captions using our AVID editing software and After Effects. The Baerclaw Productions team also researched and hired Spanish voice over talent to create the promotion same videos in Spanish. They are expecting more than 300 professionals from around Arizona who are interested in and working in the health disparities field touching on all populations and disease topics and connect research, prevention, clinical and policy arenas. If you’d like to learn more about the conference, here is the website – https://www.azhequityconf.org/. If you’d like to see one of the videos that we produced to promote the conference, you can go here – https://www.azhequityconf.org/about-us. You can also see the videos on our YouTube channel by going here for the English version – https://youtu.be/UAQ1PqBFpXo. This link will take you to one of the Spanish language videos on our YouTube channel – https://youtu.be/sr_SzQFM3r4. As a leading Phoenix production company, there isn’t a video production Phoenix project that we haven’t seen and completed. If you’re ready to produce a Phoenix video, let us be Your Resource For ALL Things Video! Call us today at 602-469-0088 for a free consultation or visit our website at www.baerclawproductions.com. 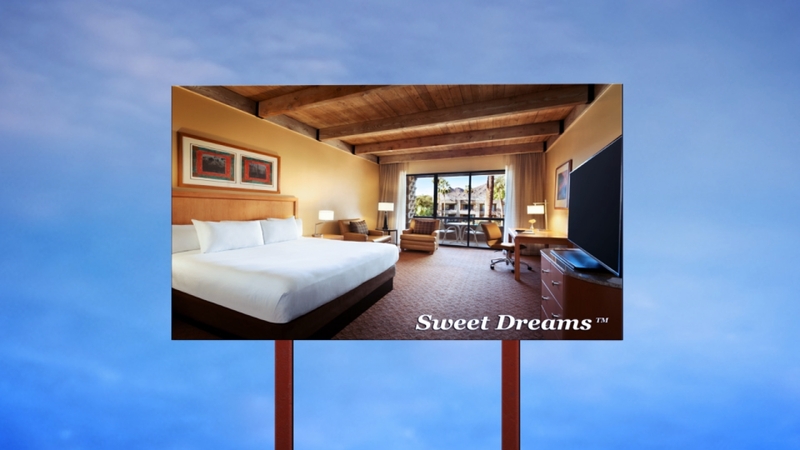 A Major Renovation Complete – DoubleTree Resort by Hilton Paradise Valley – Scottsdale turned to the Baerclaw Productions digital newsroom to spread the word! 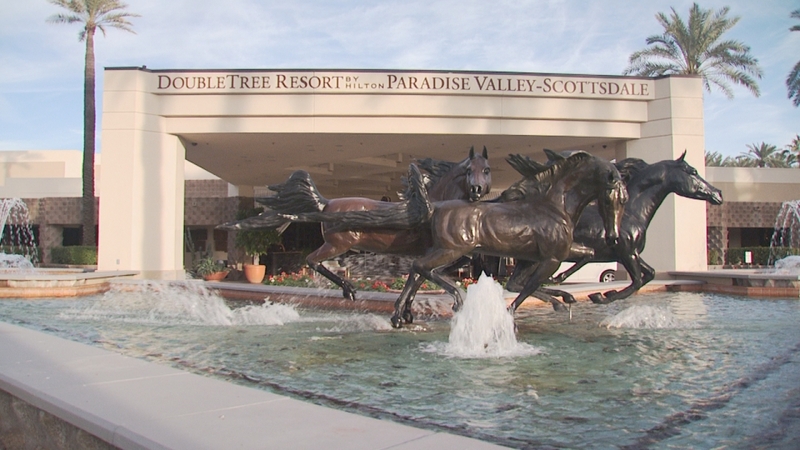 After going through a major renovation, the DoubleTree Resort by Hilton Paradise Valley -Scottsdale, a AAA Four Diamond resort, needed a video production partner to share the news across multiple platforms including websites, social media outlets and YouTube channels… enter the team at Baerclaw Productions. What started out as a straight forward project to showcase this beautiful 378 room property turned into multiple video productions to maximize the value of having a full service Phoenix video production company on the grounds to target potential customers across many digital platforms. The multiple day video shoot covered the entire property starting with the entrance, through the lobby, dining areas, rooms, suites, 40,000 square feet of meeting and event space and of course the amazing grounds and two pools! For the interior shots, we used our Sony HD cameras on a tripod or dolly to show the new features of the property. When it came to showcasing the expansive grounds, we needed a drone to gather HD video of the 20 plus acres that make up the resort and grounds that include tennis courts, basketball courts, a putting green and two amazing pools. All of this video was brought back to our Phoenix video production studio for the post production work using our state of the art video production tools. The first video production was created for the Hilton Hotels corporate website. They have very specific specifications including the total length of the video which had to be less than three minutes. With a property of this size and based on the scope of the renovation, telling that story was quite a challenge but not insurmountable. We also produced a second version of the video that was longer to ensure that we could go more in depth into the renovations that were completed and fully showcase all that the resort has to offer. That video will live on the resorts YouTube channel. But that wasn’t the end of this Arizona production. We also created a short, 30 second high energy spot that can be used on every social media outlet. All three of these videos were created from a single video production and extended the ROI for the resort. If you’d like to see what the Baerclaw Productions created, click on these links. 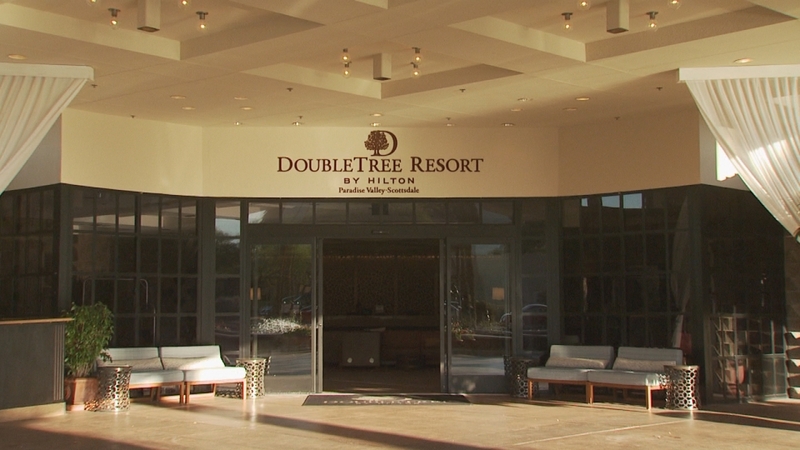 By taking advantage of the Baerclaw Productions digital newsroom services to launch a brand journalism campaign, the DoubleTree Resort by Hilton Paradise Valley – Scottsdale has multiple video assets that they can use across many platforms to promote their newly renovated property. Since 1997, Baerclaw Productions has been producing award winning videos for a wide array of clients ranging from small start-ups to Fortune 100 companies. Over the years, the Baerclaw Productions team has produced corporate videos, web videos, sales videos, training videos, testimonial videos, award videos, new product launch videos, television programming, infomercials, documentaries, green screen videos, nonprofit videos, commercials and PSA’s. If you have a need for video production to share your story with the world, count on a digital newsroom partner that is committed to being Your Resource For ALL Things Video! Give us a call at 602-789-8396 for a free consultation. Catholic Charities Arizona does amazing work every day and YOU make it happen! 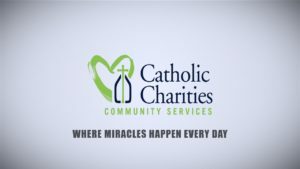 Baerclaw Productions, a Phoenix video production company, was given the honor of producing a video to explain what Catholic Charities does, who they help and how they are incomplete without you! This Arizona production was shot over multiple days by our Phoenix production company. We interviewed many of their clients and staff including President and CEO Paul Mulligan. We learned about how they touch more than 100,000 people annually in Central and Northern Arizona. We visited some of their Head Start programs on the West side of Phoenix. We met a veteran who was homeless, suffered a stroke on the streets and now is on the path the independence. We talked with a local family who utilized their Foster Care and Adoption services to build a family that now numbers more than twenty! Perhaps the most impressive thing is their philosophy. While they are a faith based organization, they ask one simple question to all that they serve… are you in need? They run more than 20 programs and work with those who are most in need and they need your help and that’s exactly why they turned to Baerclaw Productions to produce this nonprofit video. If you’d like to learn more about the amazing work that they are doing, please visit their website at www.catholiccharitiesaz.org. You can watch the video by clicking here. While the video was just released to the public, the early reaction was very positive! 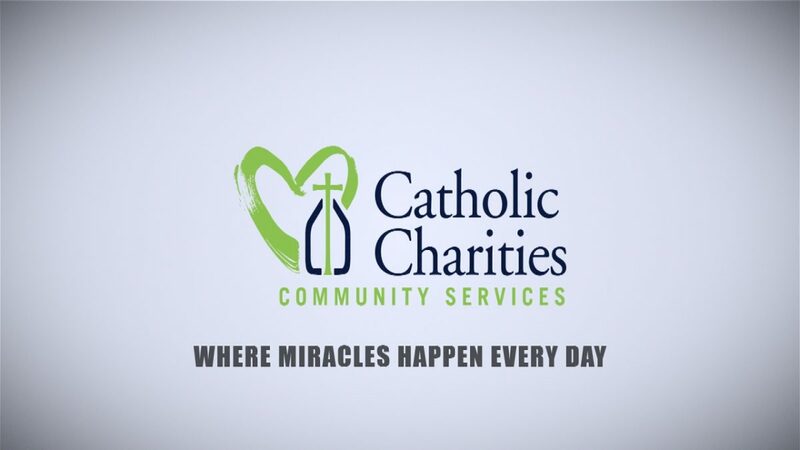 After the video played at the Catholic Charities You Make Miracles Happen breakfast, one woman commented that it gave her goose bumps! That kind of reaction makes what we do so worthwhile. While it doesn’t compare with the work that Catholic Charities does on a daily basis, being a part of sharing their story was a wonderful honor for the entire Baerclaw Productions team. Experience, creativity, and professionalism have always been a big part of what makes Baerclaw Productions special and remains the foundation for our award-winning staff. Combine that with state of the art equipment and a commitment to the customer and it’s easy to see how we consistently meet or exceed our clients’ expectations. Whether you need a nonprofit video, corporate video, web video, promotional video, sales video or training video, our team can take your vision and turn it into a video to tell your story! If you have a need for video production to share your story with the world, let us be Your Resource For ALL Things Video! Give us a call at 602-789-8396 for a free consultation. A training video that’s FUN to watch! As part of Baerclaw Productions 20th Anniversary Celebration, we are re-releasing some of the early videos that we produced and sharing a few of our memories from those videos. A training video that’s FUN to watch! Have you ever heard of such a thing? Now you have and we made it happen in the late 90’s. 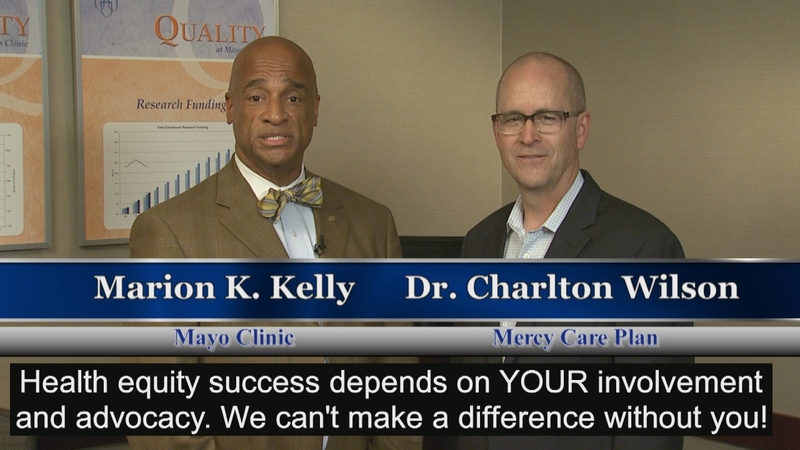 The Baerclaw Productions team was contracted by St. Joseph’s Hospital in Phoenix, Arizona, to come up with a way to produce a training video that shared critical information that had to be known across the hospital for an upcoming accreditation process. 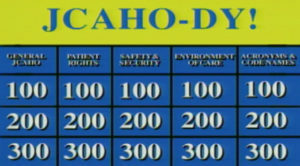 With the help and direction of our client, we came up with a take-off of Jeopardy using doctors, nurses, administrators and hospital staff. We used multiples cameras, make up people and our AVID editing system to shoot the video in the basement of the hospital. There was no set, just a wide-open space that we had to set-up, light and come up with creative ways to make it look like it was a spacious studio with a place for the three contestants to stand side by side. 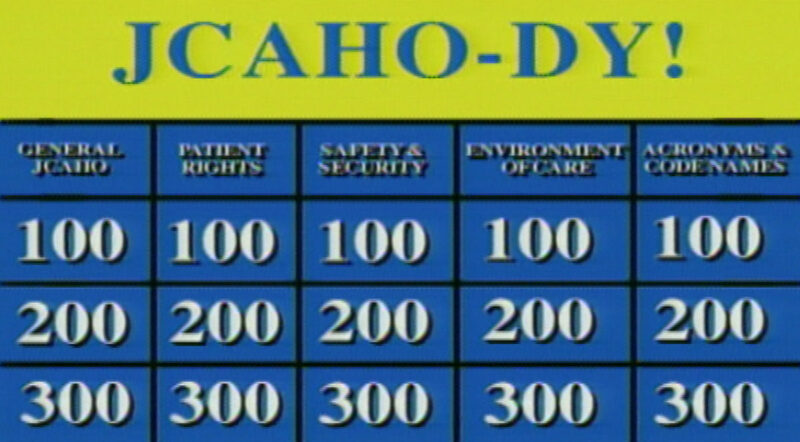 The on-location shooting was easy, but we were also tasked with creating the graphics for a board with all of the questions, tallying up the score after each question and adding in sound effects. One of the bigger challenges that we had was how to give each of the three contestants a clicker that they could use before answering a question. Since we didn’t have the budget to do it all live, we ended up using candles, wrapped in electrical tape with a cord coming out of one end that in each contestants’ hands looked very realistic. Since the entire project was scripted, we knew who was going to answer each question and then we added in the sound effects in post-production. Another fun part of this was the opportunity to use Jeff Munn, then the public-address announcer for the Phoenix Suns, as our studio announcer. If you’d like to see a training video that’s fun to watch, click here. This was a great project to work on and it was very successful. The feedback from across the hospital was positive and the accreditation was achieved. If you need to make a creative training video that doesn’t put your team to sleep, Baerclaw Productions is who you need to contact. Whether you need a training video, corporate video, web video, promotional video or sales video, our team can take your vision and turn it into a video to tell your story! The Wilson Coalition – still making a difference and still going strong! 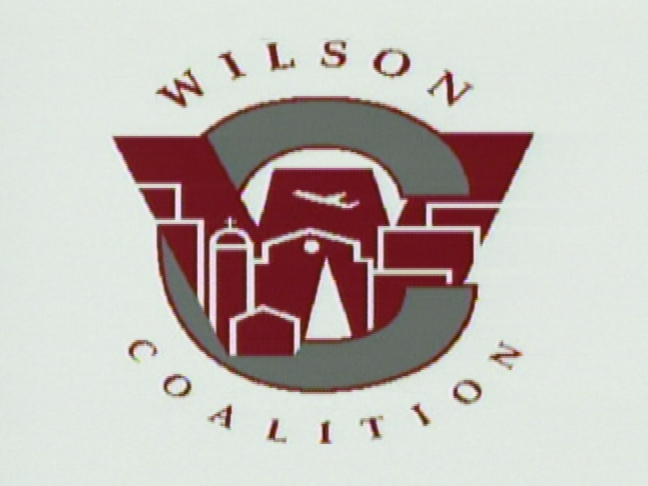 Not long after opening our doors in 1997, we were approached by Bank of America to produce a video for the Wilson Coalition, a Phoenix nonprofit organization that they supported on many levels. This was a wonderful project to work on and it was an honor to sit down and interview a wide array of folks who were involved with the Coalition. In all, we talked with almost 30 stakeholders ranging from employees of Wilson Elementary School District, city of Phoenix officials, government officials and a wide array of community volunteers who donated time, money and expertise to the Coalition as they made a much-needed difference in the community. The Wilson Coalition is still making a difference and still going strong! Their mission is quite simple – The purpose of the Coalition is to identify the needs of the neighborhood and to identify resources that can be employed to improve this neighborhood. If you’d like more information on the Coalition and the Wilson School District, please visit their website at by clicking here. You can watch the video by clicking on this link – https://youtu.be/O69KcX_gVTo. One other memory that we have from that nonprofit video production, our contact at Bank of America explained to us that, while they had a Phoenix video production company that they worked with, they had so much work and their current vendor couldn’t handle this project because of all of the other work that they were doing for the bank. He wondered when that was going to happen to us. I challenged him to try us and explained that we would never be in that situation and I can honestly say that after 20 years, it’s never been a problem even when we were working on weekly half hour television programs on top of everything else that we were doing.